Amit Chaudhary, who resigned as Congress MLA after allegedly cross-voting in favour of the BJP candidate during the RS polls, has been given ticket for Manasa seat in Gandhinagar. 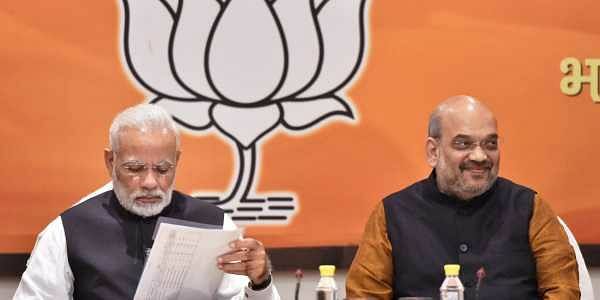 AHMEDABAD: The BJP today released its fifth list of 13 candidates for the second phase of Assembly polls in Gujarat, dropping two sitting MLAs. Prahlad Patel, who had joined the BJP ahead of the Rajya Sabha polls after resigning as Congress MLA, did not get a ticket from Vijapur constituency in Mehsana which he represented. The BJP has fielded Ramanbhai Patel from the seat. Of these 13 seats in central and north Gujarat, seven were held by the Congress, including Vijapur. The BJP has so far named candidates for 148 seats out of 182. Among the candidates named today are Gujarati actor Hitesh Kanodiya and BJP MP Prabhatsinh Chauhan's daughter-in- law Suman Pravinsinh Chauhan. Amit Chaudhary, who resigned as Congress MLA after allegedly cross-voting in favour of the BJP candidate during the RS polls, has been given ticket for Manasa seat in Gandhinagar which he represented in the outgoing assembly. The BJP has retained four of its sitting MLAs - Ranchhod Rabari (Patan), Narayan Patel (Unjha), Vallabh Kakadiya (Thakkarbapa Nagar) and Pankaj Desai (Nadiad). The party has dropped Laljibhai Koli Patel, its MLA from Dhandhuka seat in Ahmedabad. He has been replaced by local leader Kalubhai Dabhi. For Idar (SC) seat, the BJP has fielded actor Hitesh Kanodiya. Gujarat Assembly Speaker Ramanlal Vora had won this seat in 2012. However, the party has now fielded Vora from Dasada (SC) seat. For Kaalol seat in Panchmahal district, the ruling party dropped sitting MLA Arvindsinh Chauhan and chose Suman Pravinsinh Chauhan. Polling for the two-phase elections for the 182 seats will take place on December 9 and 14 and votes will be counted on December 18. Eighty nine seats of Saurashtra and South Gujarat region are going to polls in the first phase, while the remaining 93 seats in central and northern region would go to polls in the second phase.